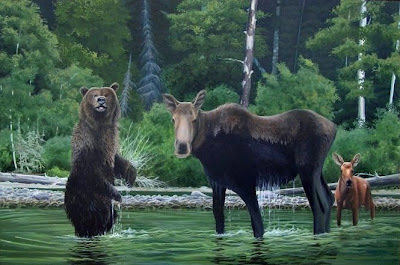 This painting was actually seen by Senator Frank Morse who has a place in British Columbia. A bear was trying to get to a moose calf while it's mother protected it. In brief, the gentleman approached in a boat and shouted. As he did so, both animals which were practically nose-to-nose, looked up right at him. The image was burned in his mind and now has become a painting that he will hang in his capitol office. For more information on commissioned paintings you can click the link below. The above 20"x30" painting has been in progress for quite some time and is proving to be a serious challenge. I think it is one of those paintings where a step forward in my abilities could be made. The thing about taking a step forward is that sometimes it takes two steps back and it's those steps where the real learning takes place. This painting has been like that. One day, I'll work on it and feel that great progress has been made and other days, I'll paint for hours and leave thinking that the painting is worse than it was before I started. 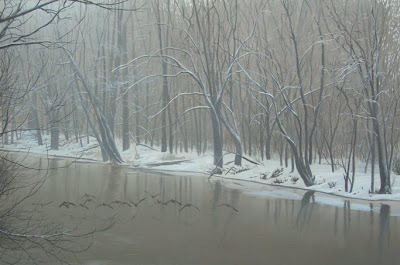 The hard part, for me, has been blending the numerous branches and the mist to create depth and realism. The image above is the painting in it's current state - now it's back to work. It's that time of year again! The Pacific Flyway Decoy Association's (PFDA) annual wildfowl art festival is going to take place on Saturday and Sunday at the Doubletree Hotel in Sacramento. The show features live woodcarving demonstrations, decoy competitions, and, yes, wildlife art! I will be at the show with about 35 miniature originals (including the one pictured), framed and unframed prints, and a couple of larger originals. The weekend is always fun and there are some amazing artists that attend. If you are in the area, drop by. This past week I spent some time in Tucson and while there, gathered some reference to complete some desert scenes. The birdlife was incredible as was the weather. There was even an encounter with a live Arizona bark scorpion in the bathroom to make the desert experience complete! Future paintings will come from this trip, but for now here are a couple of photos. My passion is creating paintings of wild animals in their natural habitat. This passion started early in life as I always knew I wanted to be a wildlife artist. For me the best part of being a professional artist is spending time in the field studying the birds and animals. We live in such an amazing world, I just want to soak in as much as possible and share it with others.